Workshop There are 2 products. 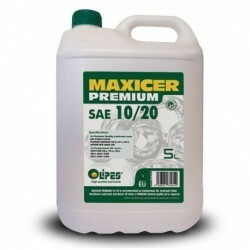 High degree refined lubricating oil with high oxidation resistance, formulated with special additives for the lubrication of reciprocating compressors and vacuum pumps, requiring a SAE 10/20 or ISO 46 viscosity lubricant in premium quality. Maxicer Premium 30/40 is a high degree refined mineral lubricating oil with high oxidation resistance, formulated with special additives for the lubrication of reciprocating compressors and vacuum pumps, requiring a SAE 30/40 or ISO 68 viscosity lubricant in premium quality.